Residents in Penzance are angry at proposals to move an historic museum from the town to Plymouth. The National Lighthouse Museum is run by Trinity House, which says the centre gets about 6,000 visitors a year. 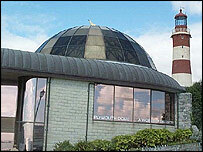 It is now considering moving the collection of lighthouse artefacts to the Plymouth Dome. But supporters of the museum in Penzance say harbour redevelopment plans could see funds made available to extend the attraction. The proposed move to Plymouth has been welcomed by Chris Murray, who is chairman of the Devon's Top Attractions organisation. He said Plymouth needed something new and the collection would be seen by more people if it was moved to the city. "We have got the National Marine Aquarium, and the Mayflower Centre opening up as well on the Barbican, and it is a fantastic location which has a whole caucus of wonderful activities going on. "It would also be great for Plymouth to have a quality collection of national significance," he said. The Dome is situated alongside Smeaton's Tower - a former lighthouse - on Plymouth Hoe. One of the directors of Trinity House, David Brewer, said a decision would be made at the end of the month.